The biggest appeal that forex trading offers is the ability to trade with margin. But for many forex traders, “margin” is a foreign concept and one that is often misunderstood. Bob sure knows his fried chicken and mashed potatoes but absolutely has no clue about margin and leverage. With a little bit of cash, you can open a much bigger trade in the forex market. And then with just a small change in price moving in your favor, you have the possibility of ending up with massively huge profits. But for most new traders, because they usually don’t know what they’re doing, that’s not what usually happens. More likely, price does move, but it moves against them. Like what happened to Bob. Bob was in a trade. He was sure that this trade was going to be a winner so he bet BIG. All of a sudden, to Bob’s surprise (and shock), he witnessed his trade being automatically closed on his trading platform and ended up suffering an epic loss. The funds that now remain in Bob’s account aren’t even enough to open another trade. He contacts his forex broker and is told that he had been “sent a Margin Call and experienced a Stop Out“. Bob doesn’t know what the broker is talking about. This is why understanding how margin works is essential. A lot of new traders do not understand the concept of margin, how it’s used, how to calculate it, and the significance that it plays in their trading. Do you know what margin actually is? What about used margin? 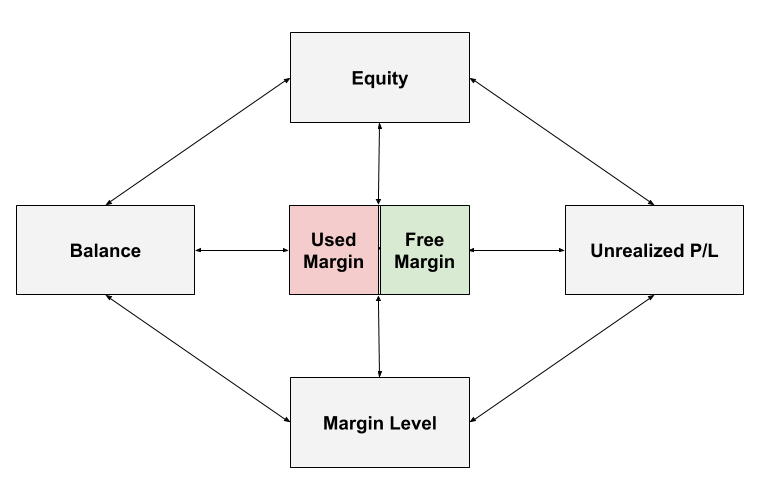 What is free margin? What is margin level? What is a margin call? What is a stop out or margin closeout? As you can see, there is A LOT of “margin jargon” used in forex trading. Before you choose a forex broker and begin trading with margin, it’s important to understand what all this margin jargon means. If you don’t, it’s almost guaranteed that you will end up like Bob. Terrible things will happen to your trading account like a margin call or a stop out. But you won’t even know what just happened or even why it happened. If you really want to understand how margin is used in forex trading, you need to know how your margin trading account really works. This starts with understanding what the heck some (really important) numbers you see on your trading platform really mean. We’ll call these numbers your margin account’s “metrics”. The metrics above are all intertwined. BEFORE ever entering a single trade on a live account. Where certain metrics fall below a certain value, BAD THINGS will happen! So you need to know what these metrics are! You also need to know what these “bad things” are! Make sure you have a solid grasp of how your trading account actually works and how it uses margin. A metric is just a measurement of “something”. This means that every metric above measures something important about your account involving margin. For example, the “Balance” measures how much cash you have in your account. And if you don’t have a certain amount of cash, you may not enough “margin” to open new trades or keep existing trades open. Depending on the trading platform, each metric might have slightly different names but what’s being measured is the same. Let’s take another look at the metrics on MetaTrader 4. You’ll notice that it looks like that “Used Margin” is not displayed. But it’s there. MetaTrader 4 just displays it as “Margin”. Same metrics as MetaTrader 4, but different labels. Don’t worry about the different labels right now, we’ll explain each margin-related metric in a way that you’ll be able to know which metric is which regardless of the exact label. We’ll also let you know what other names that a specific metric is also known by. And at the end of this Margin Trading 101 course, we’ll provide a helpful “cheat sheet” for all this margin jargon. Let’s now discuss each metric one-by-one in detail. Next Lesson What is Balance?